Paris is one of the destinations on everyone’s bucket list in life, and for a reason! The City of Love is truly an incredible place, and we had the chance to pop for a very quick weekend escape in November. Coming from Dubai, we really appreciated not only the cold after a long Dubai summer, but also the cobblestone streets, the food (CHEESE! HAM! ), the shopping and the beautiful sights, and it’s safe to say we did not have time to get bored! Having our itinerary for our 48 Hours in Paris planned ahead was tremendously important to make sure to see everything we wanted to in such a short amount of time. Our full itinerary is available on Tripverse, and the travel planning app is available offline as well - for those who, like us, don’t have a French SIM card on hand! Being able to buy priority tickets to the Louvre museum and Arc de Triomphe rooftop in advance through Tripverse was also extremely handy - who wants to wait in line in the cold! If you’re planning a weekend - or longer! - trip to Paris, here are a few sights, monuments, places, restaurants and hidden speakeasy bars you should not miss. This is our 48 Hours in Paris guide! Which monuments to visit in Paris? A classic, sure, but also impossible-to-miss place! Perfect for couple-y photos and Instagram-addicts (guilty), the Eiffel Tower is a safe spot for incredible photos. We recommend coming during that golden hour for an even better Insta Story of your 48 Hours in Paris! The world-famous 1,91km long Champs Elysées is arguably the most beautiful street in the world, especially in the evening, when the lights are on. We were lucky to be there in November, meaning all the Christmas lights were up, offering an incredible show. Make sure to check out the rooftop up the Arc de Triomphe for a fantastic view over the Champs Elysées and the Eiffel Tower light show! 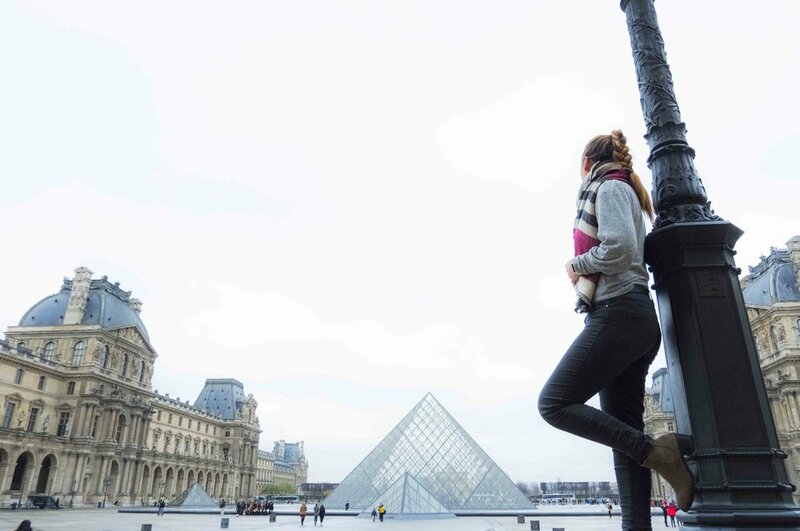 The Louvre is one of the most amazing museums in the world, and for a reason! We suggest to buy tickets through Tripverse and avoid the queue, but don’t forget to admire the external pyramidal structures as well. Plan to spend a few hours in the Louvre, it is truly an incredible place! Nicknamed by those who have been “The most beautiful neighborhood of Paris”, Montmartre is my favorite place in the city. Going up the Butte Montmartre to rediscover the view from the Basilique du Sacré-Cœur never fails to amaze me. The perfect spot for lovers and tourists, it will ALWAYS be packed in summer, so if you visit during this time, make sure to bring a picnic! Up the Butte, you will find the cutest streets, so have a stroll around, camera at the ready! The Canal Saint Martin is great for a walk out in Paris. You will find temporary art galleries, old book stores, coffee shops and cute restaurants- all with a so-Parisian atmosphere around. Perfect for a romantic walk! We visited Paris just before Christmas, so we just HAD to go to the Galeries Lafayette in Boulevard Haussmann, just to admire the beautiful lights and indulge in the incredible shopping available. Careful, you might spend more time than planned there! If you have enough time, make sure to fit in a trip to the Catacombs of Paris. The underground ossuary is just the right amount of scary, while offering you a whole new vision of Paris, through its ancient underground cemetery. Make sure to do a proper tour (you can buy tickets in advance through Tripverse) and don’t get lost in the Catacombs..! Which are the best restaurants in Paris? Every corner of Paris is filled with the most typical French restaurants, and you are almost always sure to eat and drink well in any place you stop, so it’s really difficult to pick our favorites! If you come in winter to Paris, there is no other place to go than Le Chalet Savoyard - we won’t judge you if you also come in summer! You will find all the classic dishes from the Savoie region, including all the cheese possibilities of fondues, raclettes and other delicious winter delicacies that you can imagine. Located in 52, Rue de Charonne, the restaurant is really a must do in Paris. Make sure to book in advance! A small, no frills restaurant, La Petite Rose des Sables offers traditional French specialties cooked with love by the owners, who are amongst the nicest Parisians you’ll meet. If you’re looking for french cuisine at its best, in the quaintest Parisian atmosphere, this charming restaurant is a must try. What are the best speakeasy bars in Paris? Bisou is a very unusual cocktail bar in Paris - there is no menu. The barmen will prepare the cocktail that you’ll like, based on your preferences! The point is to have patrons interacting with barmen, to create the perfect cocktail for them. You can order a mojito with a twist, or a completely made up cocktail in the romantic terrace of the cocktail bar, accompanied, of course, by a cheese platter or a charcuterie plate. A must try! An excellent speakeasy cocktail bar with great music, you enter the Ballroom through a unmarked black door followed by a few stairs. The cocktails are creative and well executed, and the bar is connected to the restaurant Beef Club, if you fancy a good steak with your cocktails! You can also take a mixology class to make your own cocktails. The Little Red Door is literally accessible through an Alice in Wonderland entrance (or more exactly, the door right next to it), and will bring you to a world of delicious and artistic cocktails in a cool setting. A really quirky take on Parisian style, the Little Red Door is a place to visit for every cocktail lover! If you are visiting Paris in the summer, don't forget also to check out our selection of 8 rooftop bars in Paris! Do you have any other addresses to share for an unforgettable 48 Hours in Paris trip? Let us know in the comments below!